Cath was a woman of great purpose, great integrity, tenacity and diligence. I was proud to be a friend and am honoured to be able to share some of her stories, and to listen to others. All showing what a remarkable woman she was. I loved listening to Cath talk about her exploits as a young single woman in the forties and fifties. How she went to Yugoslavia to build roads for Tito and socialism. Her hike across Scotland and the discomfort of rain and tents. How she bought the house in Shannon Street after she returned in 1952, using money her mother had left her. It cost 2000 pounds – people told her she was mad. Cath ignored them, went to carperntry classes, lined the walls and built all the cupboards in the large kitchen/dining area. They are still there today. Cath was a leader in the public service equal pay campaign. She relished talking about it and on one occasion I taped her. What follows are Cath’s words taken from that tape. “Equal pay had been an issue for the PSA all along. Rhona Bailey had been at the forefront of a campaign in the 1940s after the war. In 1955, the Wellington section supported a resolution by Jim Winchester that the executive launch a major campaign for equal pay. It was the treatment accorded to Jean Parker in 1956 that gave the campaign impetus. She was a most efficient clerk with eight people under her. So when a male cadet was promoted over her, she laid an appeal – and she won it. Then they demoted her. There was absolute outrage, not only within the PSA but publicly. There was a lot of media coverage and the case was debated in parliament. Eventually her salary was reinstated but by this time the equal pay campaign had really taken off. Margaret Long was the convenor of the PSA women’s committee, which had two positions on the executive, and I was chair of the Wellington women’s committee. The campaign was particularly active in Wellington, the Waikato and Palmerston North. Wherever there were activists. We held lunchtime women’s meetings in all the government departments. We organised two big Town Hall meetings in Wellington, attended by over 1000 members. I remember running off leaflets on a Gestetner in the dead of night. Buffet teas were a big organising tool. We would invite a speaker and sell tickets. It amused us that here we were, non-respectable women doing such a respectable task as having a buffet tea. One of our tactics was to meet with MPs. Equal pay was in the Labour Party’s manifesto but Walter Nash, the Labour prime minister, was very reluctant to support it. The only reason the Equal Pay Act was passed was that Nash was overseas at the time. Jack Turnbull, the PSA general secretary, got the law drafting office to draft the bill. It went through parliament and National voted for it as well. We won this through a mixture of clever tactics and the strong opinions of women both inside and outside the PSA. You have to keep going. You don’t win anything without a struggle. And even when you do win it, it tends to disappear unless you keep on putting in the effort. It was very pleasing that Cath was presented with the CTU ’s lifetime achievement award in 2015. Cath was presented with the award by her daughter, Helen. 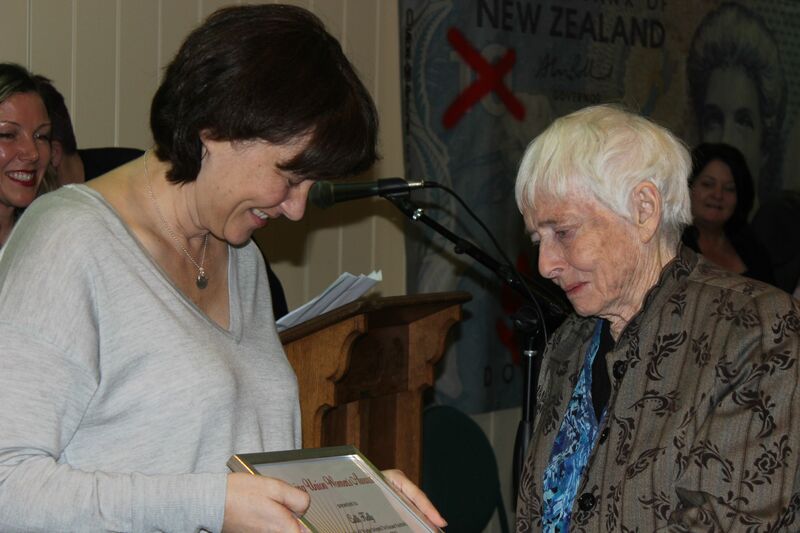 Cath was inclined to dismiss the contribution she made to a range of political and social issues in New Zealand – she often chose to take a back seat. Her consistent approach was to give the recognition to the ‘rank and file’- to her, they were the essential heroes, not any individual. Her view was that historical change wasn’t achieved by individuals like herself, but by the action of many. Cath’s reasons for getting involved in the equal pay campaign were the same reasons she had for getting involved in campaigns about the Vietnam War and Apartheid. She saw injustice and oppression and it wasn’t right. She had convictions and values that provided a better way, both socially and economically. Cath’s involvement in achieving equal pay is echoed in what’s happening now: There’s a continuum of course: the campaign for equal value equal pay/pay equity; the successful court case and negotiations for fair pay for care-workers; and the expected amendments to the Equal Pay Act 1972. Many people here are still involved in campaigns about these issues – and I think of her often when they’re being discussed. In the early 1950s, Cath was a Maori Affairs typist [with a university degree which was unusual in the Public Service then] and what was referred to as an ‘international outlook’. She’d travelled overseas; studied law for a while coming in the top few in her year; done a range of jobs – working as a teacher, and a road builder amongst other things. Naturally, she joined the PSA and a Wellington-based discussion group of PSA left wing activists: Korero, which was to play a key role throughout the equal pay campaign. Members included her close friend Margaret Long …. Others involved as members, counsellors or supporters included Rona Bailey, Margaret Corner, Jack Lewin, Dan Long, Jim Delahunty, Shirley Smith and Bill Sutch and so many others. Cath’s strategy, along with Margaret and later Dan Long, was always to involve the ‘rank and file’. She had a strong belief that support had to be built with organisations beyond the PSA. With all trade unions, workers and other interested organisations. This was a major focus. Equal pay activity brought Cath to the attention of the Security Services early on. Cables from the U.S Embassy in Wellington 1958, referring to communist sympathisers, including Cath – note the role she played: “The only activity which communists have directly controlled recently has been the drive for equal pay in the Public Service. Mr Jim Ferguson, Miss Eichelbaum and Miss Brand/Long have conducted this agitation”. [A NZ Security Service spy who had infiltrated meetings, including at Cath’s house, described her as a “striking beauty …’]. The injustices Cath saw, in her daily work, were in the entrenched discrimination for women in the Public Service. Cath saw the elitism and sexism in pay structures and employment opportunities for women. The context at that time can be summed up by the comments of Acting Public Service Commissioner, George Bolt, who chaired the Investigations Committee on Equal Pay set up by the Public Service Commission. He said: There is not one girl in a 1,000 capable of filling a controlling position over male and mixed staff. His view was that “We as taxpayers would be greatly concerned if the government agreed to purchase an article for six shillings when such articles could obviously be purchased for five shillings.” Cath saw that statement as a wonderful opportunity and said: “Bolt set the place alight. We quoted it up and down the country.” ….with great success. I was active in the campaign itself. That was my role. Cath in her work around equal pay, and in all her other activism, was an initiator, organiser, analyst, strategist, speaker, writer, communicator, internationalist – a true grass-roots activist. If you were lucky enough to have Cath as a friend – you had someone whose friendship you could rely on completely, someone who was loyal, affectionate, supportive and generous. I’ll miss her wry and often wicked sense of humour, her integrity, her conversation – and her pithy observations and analysis on politics and politicians. Margaret Corner [1988), No Easy Victory: Towards Equal Pay for Women in the Government Service 1890-1960. Mark Derby , Dan Long and the Rise of White Collar Unions.